And Tips On How to “Process Improve” Your eMail Inbox! What we are trying to say is, if you’ve been tasked to “improve things,” don’t be overwhelmed by terms like process design or process improvement, and don’t try to make things bigger or fancier than they have to be. What you do doesn’t have to be fancy or showy — simple is definitely better in the process improvement world. Grilling the perfect steak (season, marinate, sear, flip, grill, serve), getting ready for work in the morning (turn off alarm, shower, dress, breakfast, coffee, car), checking your eMail (sort, read, respond, file). These are all processes, and most, if not all, have the opportunity to be more efficient or generate better results. Let’s look at that eMail one a little closer. Do you follow the four eMail steps mentioned above? Or, are you like most people in that eMail causes you untold anxiety every single day? Is your Inbox full of unread eMails? Do you try to keep up, but never quite get there, and then get more emails from people wondering why you haven’t responded? Guess what? You have an eMail process. It may be ineffective, but you have one! And improving it doesn’t have to be hard. If your boss told you to fix your eMail process, what would you do? Would you buy expensive process mapping software and hire a consultant to see what the problem is, and then take a training course in how to handle your eMail effectively? Instead, I hope you would get a pencil and a piece of paper and draw a really simple process map and really think about all the steps that you take to handle your Inbox. If you do it right, the problem will jump off the page at you. Easy peasy. So what is your process for handling eMails? Let’s say you just got back from vacation to find 480 unread emails, and you think, “OK, that’s it! I can’t handle this anymore — there needs to be a better way to handle my Inbox. Simple. Straight forward. But no problem appears to jump off the page, so I guess there’s nothing to fix? That’s the difference between what we call a “Thought to Be” process map and an “As Is” process map. When you dig into it, the“As Is” really tells the story. In this example you’re wasting time and energy by handling each eMail one at a time, whether they are “info only”, “action required”, “urgent request”, or “meeting requests”. Now the problem jumps off the page — it’s actually a loop with no defined ending! What if you looked at your Inbox as a pile of tasks, and organized them just as you do your daily To Do list? 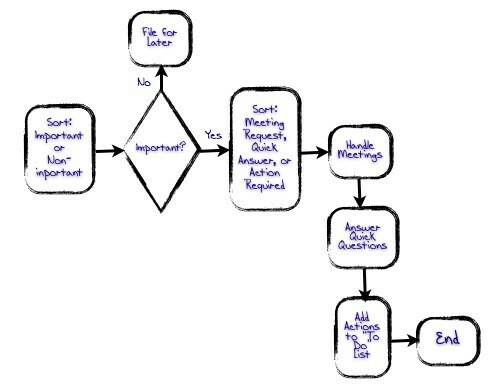 Then your process map might look like this (we call it the “Should Be” process map). Suddenly there’s nothing in your Inbox but prioritized action items. Your new efficient process has saved you time and energy, and your customers (and your boss!) are happier with your response time. Some process improvement work requires big fancy peacock solutions. But if you look around you, there are probably dozens of opportunities to make things better by being less fancy, and using some simple techniques, like process mapping. If your eMail Inbox is out of control, I suggest you start there… Let me know how it goes! Hey if you liked this, please follow me or clap so that this article gets shown to more readers like you. Or, you could just do a little jig in your living room. Whatever makes you smile. And speaking of smiling, there’s a new Medium Publication called At The Whiteboard. Please follow it for more tips and tricks on process improvement, productivity, leadership, and change management. See you there! Co-Founder of whiteboardconsulting.ca. Publication: At The Whiteboard. Top writer in Leadership and Productivity. A publication for Employees, Managers, Senior Leaders, and anyone else who wants to crush it at work.